Black PVD stainless steel case with a brown leather strap. Fixed black PVD bezel. Black dial with luminous orange hands and index hour markers. Arabic numerals mark the 3, 6, 9 and 12 o'clock positions. Minute markers around the outer rim. Dial Type: Analog. Luminescent hands and markers. Day of the week and date display at the 3 o'clock position. Eco-Drive E011 eco-drive movement. Scratch resistant mineral crystal. Pull / push crown. Solid case back. Case size: 42 mm. Case thickness: 11 mm. Round case shape. Band width: 22 mm. Band length: 7.5 inches. Tang clasp. Water resistant at 100 meters / 330 feet. Functions: date, day, hour, minute, second. Additional Info: citizen's eco-drive technology harnesses the power of light (natural or artificial) and converts it into energy which is stored in a permanently recha. Casual watch style. Watch label: Japan Movt. Item Variations: BM8475 26E, BM8475.26E, BM847526E. 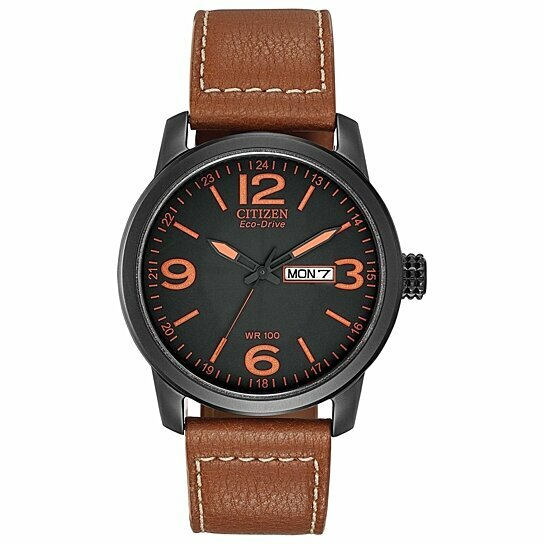 Citizen Eco Drive Black Dial Brown Leather Mens Watch BM8475-26E.